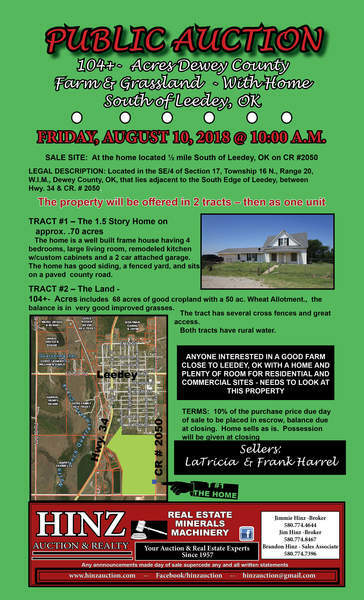 FRIDAY, AUGUST 10, 2018 @ 10:00 A.M.
LEGAL DESCRIPTION: Located in the SE/4 of Section 17, Township 16 N., Range 20, W.I.M., Dewey County, OK, that lies adjacent to the South Edge of Leedey, between Hwy. 34 & CR. # 2050. The home is a well built frame house having 4 bedrooms, large living room, remodeled kitchen w/custom cabinets and a 2 car attached garage. The home has good siding, a fenced yard, and sits on a paved county road. 104+- Acres includes 68 acres of good cropland with a 50 ac. Wheat Allotment., the balance is in very good improved grasses. The tract has several cross fences and great access. 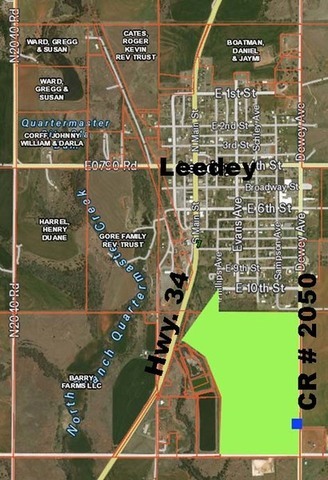 Both tracts have rural water. 10% of the purchase price due day of sale, to be placed in escrow. Balance due at closing.